We have seen countless times the frustration homeowners experience when abandoning a leaf protection system that has failed within a few short years. Whether its from the weight of debris or snow accumulation, or from the damaging effects from the sun and other elements, many of these inexpensive, store bought systems will fail, usually sooner than later. Although some of the more advanced leaf protection systems can be expensive, gutter screens can be very effective, and installed at a reasonable price. A quality gutter screen should be a metal, one piece design, and should be durable enough withstand moderate weight from snow and debris accumulation. As with all leaf protection systems some maintenance will be required. If maintenance is performed regularly, then removal of gutter screens to clean the gutters in not usually needed. We took these pictures below at a recent gutter cleaning in Ellicott City MD. As you can see, the gutters had not been maintained or cleaned in a long period of time. Most store bought systems would have collapsed, bent, broken, or distorted, compromising the system and forcing the homeowner to abandon it altogether. Since the homeowner had a quality, ridged leaf protection system installed, the gutter screens were completely unaffected by the long term neglect and debris accumulation. As you can see in the pictures, once the debris were removed the gutter screens look and function the same as the day they were installed! No Trees, No Leaves, No Problem? You may ask yourself, why would I need a gutter cleaning if there are just a few trees near my home? If you notice gutters on your home that use to be functional but are now overflowing, you may want to consider GutterMaid first before you call a costly gutter repair provider. Often times gutters become clogged with other types of trash and debris such as tennis balls and birds nests. 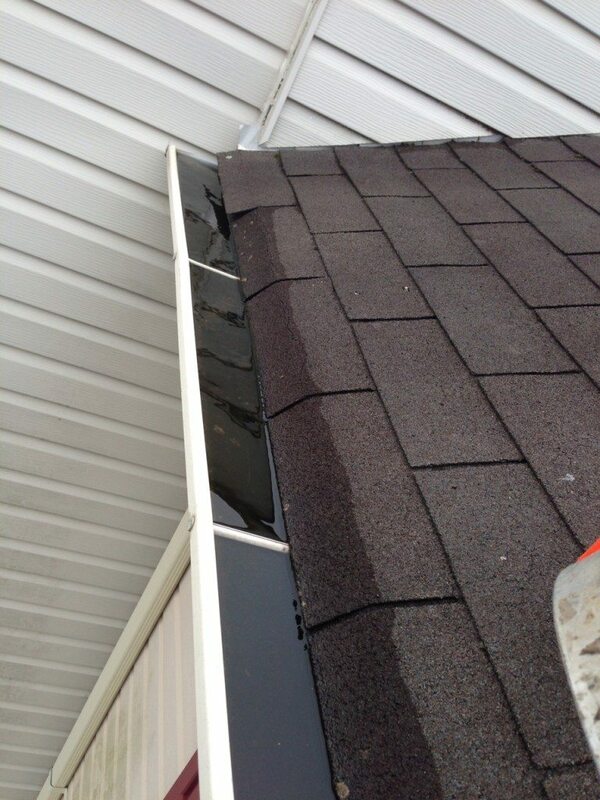 Below is a picture we took while performing a gutter cleaning service in Frederick MD. This homeowner was surprised to have found her gutter full of water due to a piece of shingle that had broken off and blocked the water from entering the downspout. GutterMaid does its part to “go green” and help protect the environment wherever possible. All of our trucks run on fuel-efficient, six cylinder engines, and we use advanced software to route our jobs and minimize fuel consumption. All of our “paperwork” is done electronically wherever possible, from our initial collection of customer information, to our invoicing and payment processing. Help us do our part by taking advantage of our convenient online invoicing and payment processing. All that is required from you is an active email address and we’ll take care of the rest!